A reformed teaching practice can dramatically change your classroom and help your students achieve levels of understanding and engagement that even great lecturers will envy. On a personal level, knowing this has freed me from trying to be the teacher that I am not. Instead, I can focus my energies on building my skills and developing materials for the active engagement of my students. I had the very good fortune of starting my teaching career working alongside one of those teachers who had “the gift” for teaching. From my room next door I could hear his class routinely breaking out into laughter and whooping with excitement. Conversations with him revealed a deeply insightful and reflective practitioner who carefully crafted each lesson. Students adored his classes. He taught me a great deal about teaching and my role as the teacher. Perhaps the most important thing I learned was that I would never be a great lecturer. I could never conjure his wonderful combination of spontaneity, humour and insight. 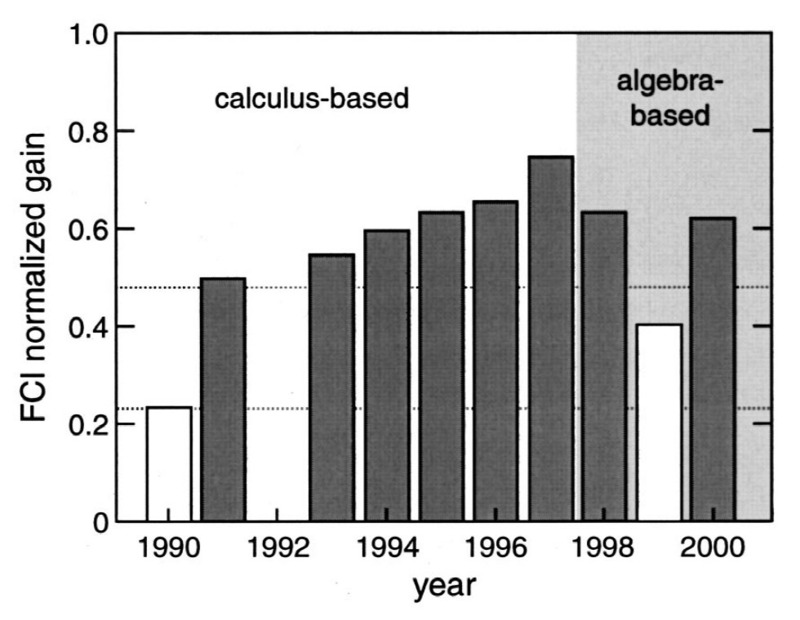 A decade later I began to learn about physics education research (PER) and discovered something that shocked me. 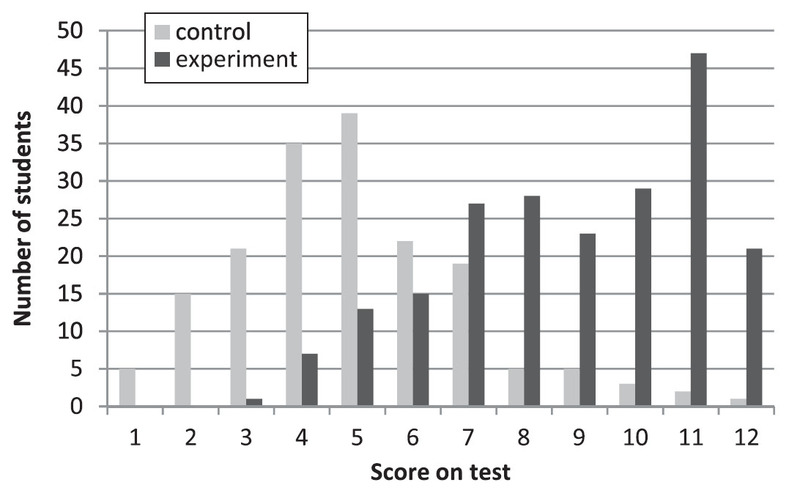 Physicists had been using standardized tests to measure students’ gain in conceptual understanding over the duration of a physics course. The results revealed that even students of the most highly regarded lecturers had a surprisingly small gain in understanding. It was as if there was a limit to the educational power of even the most dazzling lectures. The research I had come across was based on a widely used conceptual test: the Force Concept Inventory (FCI). Six thousand students from high school, college and university wrote this test near the beginning and end of their physics courses. By comparing students’ pre- and post-test scores, a learning gain was calculated to serve as a measure of the effectiveness of instruction. These results are shown in the diagram below where traditional instruction has the coloured symbols. It came as quite a revelation to me that no matter how insightful or entertaining a traditional lecture might be, students have a very limited average gain of 0.23. A gain of 0.30 seems to be an upper limit on understanding from this mode of teaching. 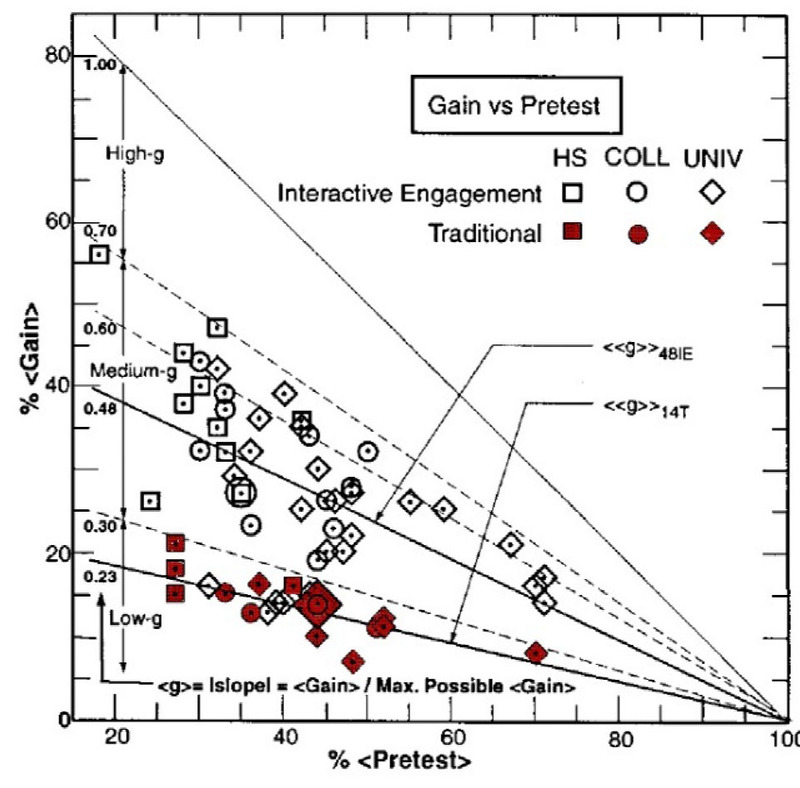 Note, however, that physics programs using interactive engagement techniques show considerably better results. The low gains resulting from lecture-format instruction were also a surprise to Eric Mazur, a reknowned physics professor at Harvard University. Mazur was an outstanding lecturers who garnered perennial glowing reviews from his first year students. In this video he recounts the transformational experience of using the FCI. Listening to Mazur shattered my long-held mental model in which students’ understanding was the effect of a mythical “great teacher” at work. The impetus to write this article came to me after PER recently made it into my local newspaper. The University of British Columbia conducted a study in their first year engineering physics classes that demonstrated the success of reformed teaching techniques in a clear and decisive way. 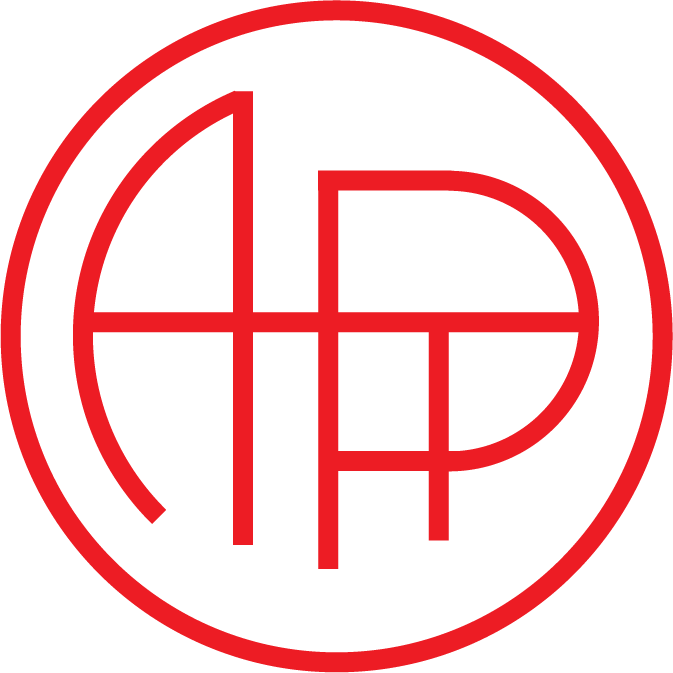 All of the students were taught using the traditional lecture technique for the first 11 weeks of the course. During the 12th week of the course half the students continued to be taught in this same fashion by a highly experienced and well regarded professor while the other half was taught by two inexperienced instructors who used interactive teaching techniques. After demonstrating the similarity of the two groups of students, the researchers measured students’ engagement levels during the 12th week and used a standardized test to measure students’ understanding of content introduced in the 12th week. The results were astounding; the control group scored 41% on the test while the experimental group scored 74%. The histogram below shows how little the two groups’ scores overlapped. Follow-up surveys also demonstrated how the new interactive strategies were very well accepted by the students. Our faculties of education must seize upon these results, which demonstrate that we really can “build a better teacher”. We now know of clear, concrete ways to help teachers improve their students’ understanding of physics. It may not be an exaggeration to say that there is an immediate improvement once a teacher steps away from the lecture podium or chalkboard and begins actively engaging her or his students. Consider the results of Eric Mazur shown in the graph below. He first used the FCI in 1990 and discovered how little his students were learning. The following year he introduced a reformed physics course and learning gains doubled. Gains steadily increased for a few more years as he gained skill using the new techniques and refined his course. There is something very special about a teacher whose personality can enthrall and energize students. I still admire these teachers. And I still believe that enthusiasm and inspiration are critical for helping students find their way and muster the energy to work hard. But decades of physics education research strongly suggest that the power of a teacher’s personality cannot transform a poor way of learning into a good one. Where teaching charisma falters active engagement techniques succeed. A reformed teaching practise can dramatically change your classroom and help your students achieve levels of understanding and engagement that even great lecturers will envy. On a personal level, knowing this has freed me from trying to be the teacher that I am not. Instead, I can focus my energies on building my skills and developing materials for the active engagement of my students.